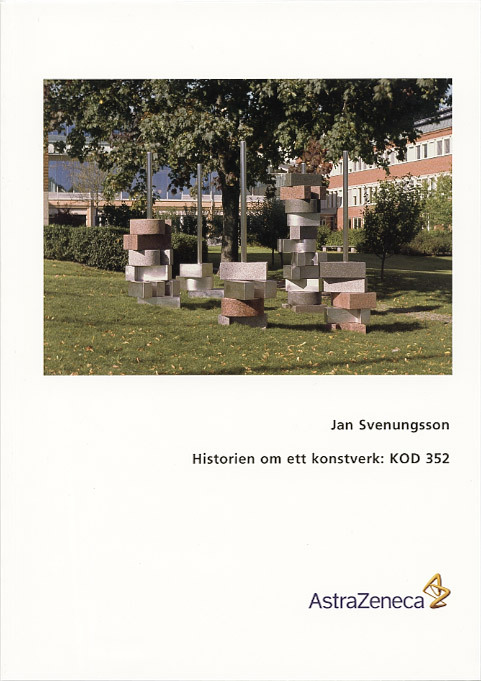 Jan Svenungsson - "Historien om ett konstverk: KOD 352"
A book on the sculpture installation at AstraZeneca Swedish Headquarters in Södertälje, written, illustrated with photos and drawings as well as designed by JS. The first part of the book discusses the new sculpture in the context of some earlier work by JS. The second part consists of a composite discussion on the "usefulness of art" between JS; the artist Karl Axel Pehrson; the scientist Maria Anvret and the philosopher Alexander Bard. Published by AstraZeneca 2004. ISBN 91-89326-11-3. Edition 1000. Hardcover. 38 pages. Size: 23,9 x 17 cm.